In 2012, Mr. Kim (40s, Seoulite) undergoes surgery at a plastic surgery clinic to get rid of his double eyelids. The procedure involves making a cut in the eyelid and injecting fat there. The surgery does not go very well. Two years have passed, but Mr. Kim still has scars left on his eyelids. After much thought, Mr. Kim decides to receive a second surgery (at the same clinic) to rid the fat. But this surgery does not go well either. During the procedure, Mr. Kim is poked (twice) in the eye by an injection needle! Mr. Kim is now traumatized and furious. He is intent on letting everyone in Korea know about what the clinic has done to him. To this end, Mr. Kim goes about posting his story on many public websites a total of 49 times. (In the posts, he reveals the name of the clinic and even tries to recruit people willing to file a class suit against the clinic.) FYI, none of Mr. Kim’s posts are ever outright lies. Some exaggerations, but by and large true accounts. Soon, the clinic files a criminal complaint, and Mr. Kim is indicted for “Cyber Defamation.” Trial begins. Q: What punishment, if any, can Mr. Kim expect under Korean law? The above example is very similar to an actual case recently reported here in Korea. The Seoul Central District Court found Mr. Kim guilty of “Cyber Defamation” (via a true statement) and fined him 3 million won. Note 1: In Korea, defamation is a crime, and truth (alone) is not a defense. 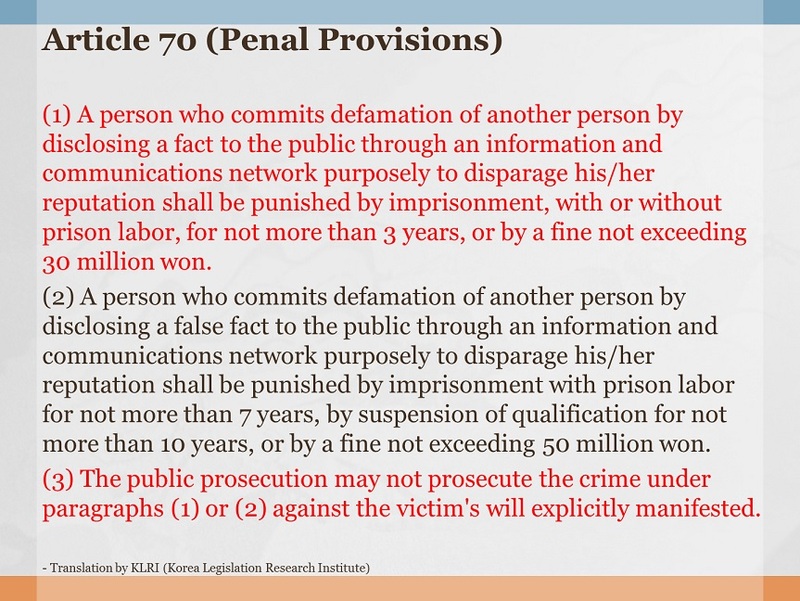 Note 2: When defamation is perpetrated online, the crime is “Cyber Defamation” under Article 70 of the Act on Promotion of Information and Communications Network Utilization and Information Protection, etc. (정보통신망이용촉진및정보보호등에관한법률). In this case, Article 70(1) applies because the crime is “Cyber Defamation” via a true statement. Article 70(2) is for “Cyber Defamation” via a false statement. Note 3: Although “Cyber Defamation” is a crime, the perpetrator can avoid punishment if a settlement is reached with the victim. A prosecutor cannot proceed further once the victim has made clear that he/she does not wish the perpetrator to be punished. See Article 70(3). 1) That Mr. Kim posted his story on public websites where random people (not just plastic surgery patients) could easily read. 2) That Mr. Kim posted numerous times. 3) That Mr. Kim went so far as to employ the help of an online marketing firm to systematically propagate his story. Normally, posting something “solely for the public interest” automatically negates the above “purposely to disparage” element. So, a defendant such as Mr. Kim would have to argue what he did was “solely for the public interest.” I’m sure the argument was made. Here, that argument was not recognized because the court probably felt Mr. Kim’s actions went overboard. His actions, as a whole, were probably seen as being (at least) partly retaliatory. They weren’t “solely for the public interest.” Had he posted just on “relevant” websites and done so less “systematically,” the outcome could have been different. 1) The “solely for the public interest” defense was recognized in a case where an angry plastic surgery patient posted simply a one-liner online comment (Supreme Court Decision of May 28, 2009, 2008Do8812). 2) Likewise, an angry postnatal-care center user who posted her story 9 times, but only on postnatal-care center info websites was found not guilty (Supreme Court Decision of November 29, 2012, 2012Do10392).